I remember growing up, my mother would do laundry every Wednesday. She would do as any other person would – separate the clothes by their colour and fabric type. 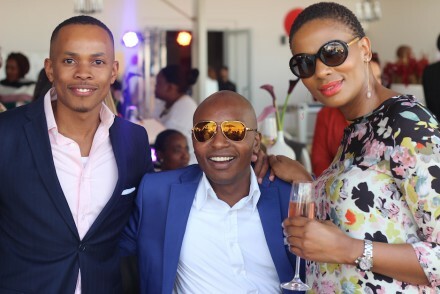 Whites and neutral colours were on one side, delicate fabrics on the other and darks on another side. Thereafter she would wash each load, either by machine or by hand, separately. Once the whites were done washing, she would follow with the delicate clothes and later on the darker shades. These loads never came into contact with each other, not even when being hung out to dry. I was so accustomed to her laundry routine that I would probably be able to follow it in my sleep. Even though my mother would separate the loads, she still used the same detergent to wash each of them. It was a standard practice; my grandmother, aunts, and even my neighbours did the same. So needless to say, when I got older and my laundry became my responsibility, I did the very same thing of using the same detergent – regardless of the shade or fabric type. 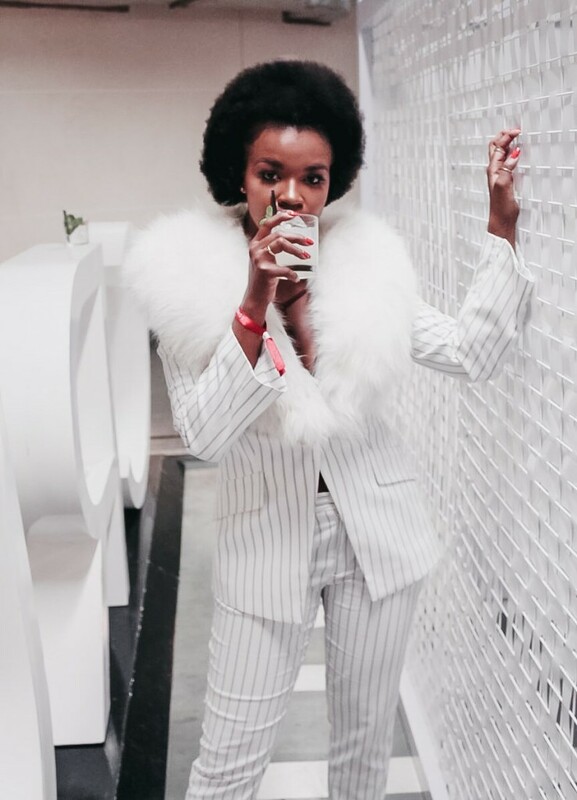 Now, as a fashion blogger, my clothes are something I pay critical attention to. 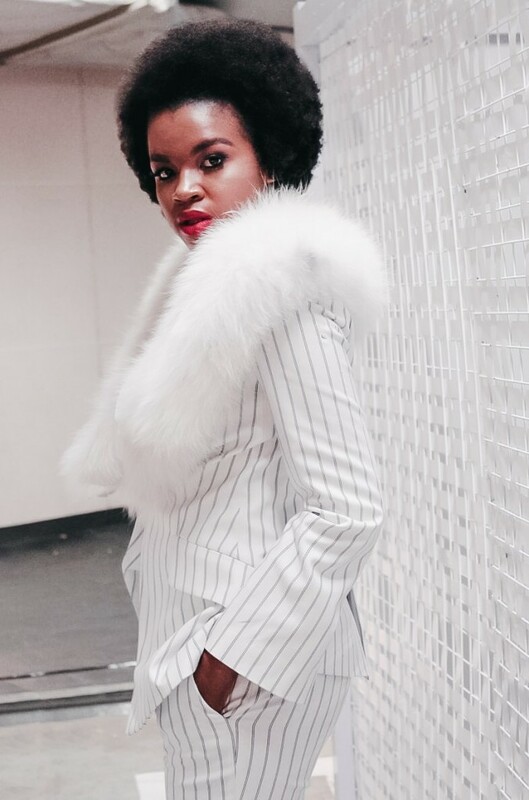 I notice when my darks begin to fade, or when my whites are no longer white. For some reason, it never occurred to me that making a calculated choice regarding the detergent I use for my clothes could assist in preserving their quality and lifespan. I often found myself having to purchase some clothing items more than once. My white vests, shirts and jeans – I would need to own more than two of each because their fresh and crisp-white state would not last as long as I needed them to. They would turn that nasty yellow-ish colour after three to four washes – a very frustrating occurrence, I must say. Not to mention that it cuts deep into the pockets, proving an unsustainable answer to my problem. I even remember the suggestion of using bleach to brighten my whites which, as we have all come to learn, only led to the damaging of my clothes over time. 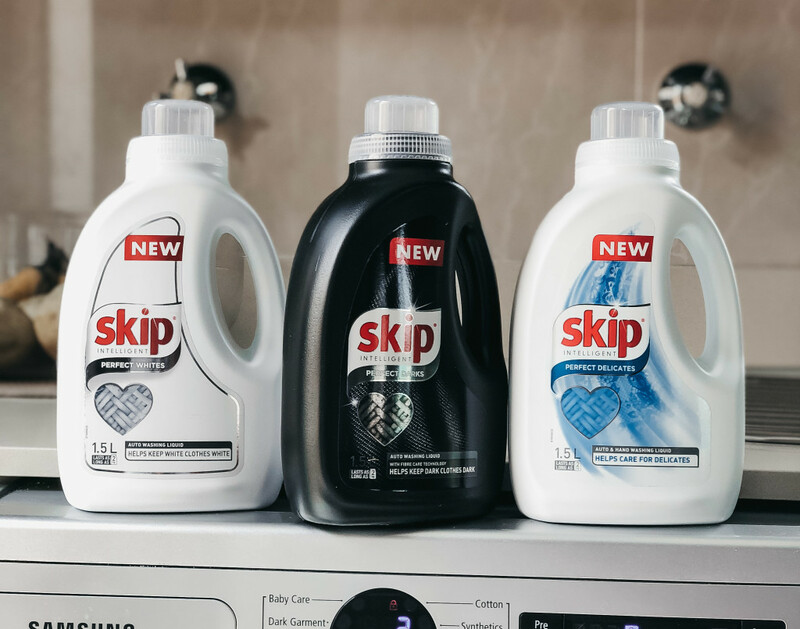 A couple of weeks ago, I was introduced to the new SKIP Intelligent Perfect range. Consisting of three different washing liquids, each has been carefully formulated to specifically cater for the three different loads my mother and so many other people separated their laundry by; whites, delicates and darks. 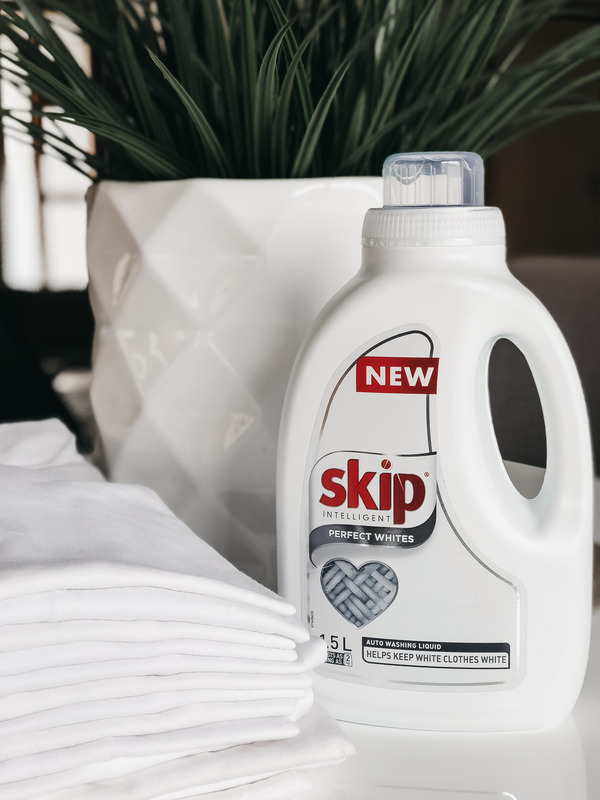 SKIP Perfect Whites is designed to keep clothes looking crisp and clean, brightening the fabric whilst removing stubborn unwanted stains. 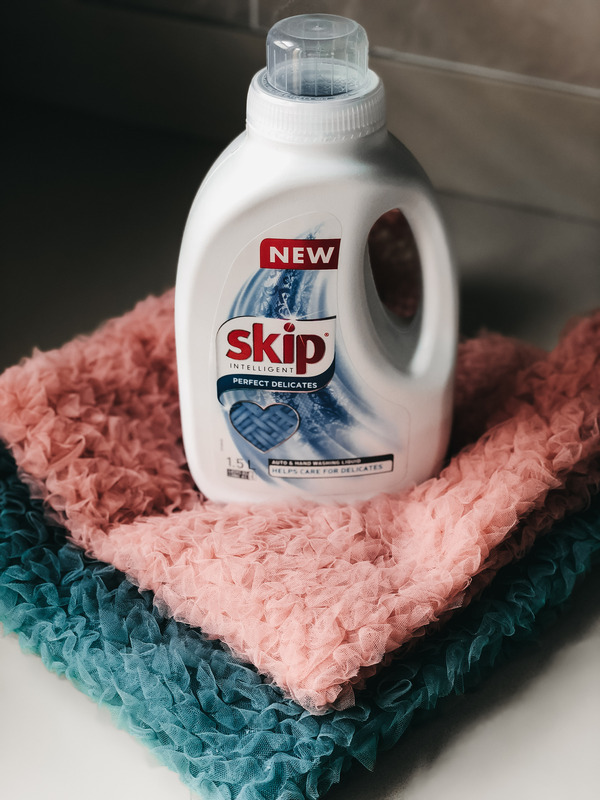 SKIP Perfect Delicates works fabulously for both machine and hand washing, gently cleaning delicate garments such as chiffon, lace and silk. 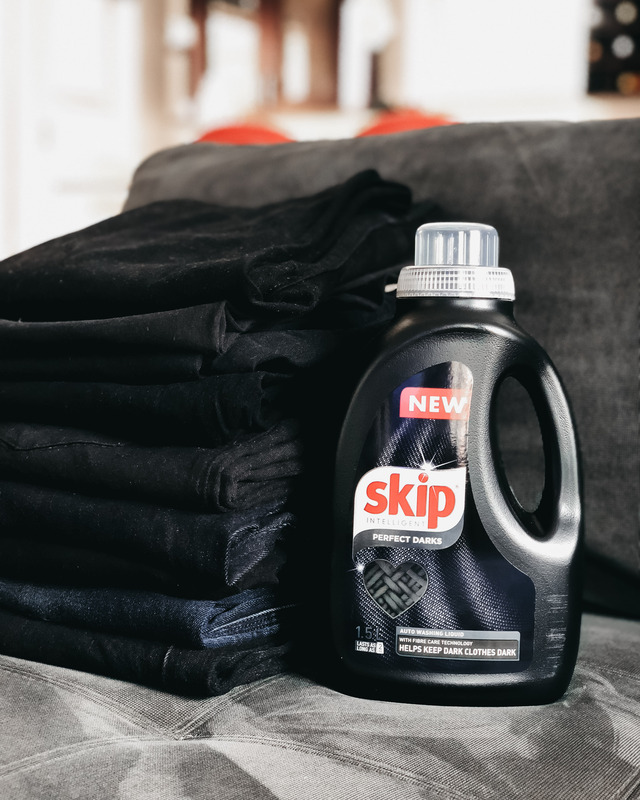 SKIP Perfect Darks is formulated to prevent fading and keep all dark clothes looking new, whilst also removing bobbles (those annoying small strands that gather on jersey fabrics after a couple of washes.